A daring group of wingsuit pilots leaped out of a helicopter and soared through the skies alongside the wings of a plane. 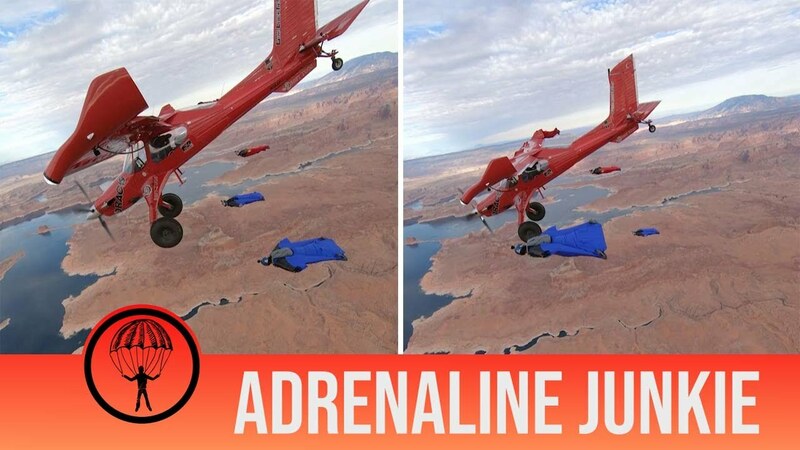 Helicopter pilot and wingsuit diver Nicholas Sacco decided the biggest form of flattery would be imitation, as the daredevil bravely jumped from a chopper and flew alongside a plane over Lake Powell in Arizona. Nicholas, from Las Vegas, Nevada, opened the door to reveal the beautiful lakes and barren deserts far below while hanging on the outside of the helicopter. Along with fellow wingsuit enthusiasts Matt Gerdes, Mike Swanson, Will Kitti and Keith Forsyth Nicholas took flight from the safety of the helicopter. Yeah…but who’s going to take them back to civilization now that they’ve landed?